There is a saying that some of the best things in life are free. Today was proof of that for our family. 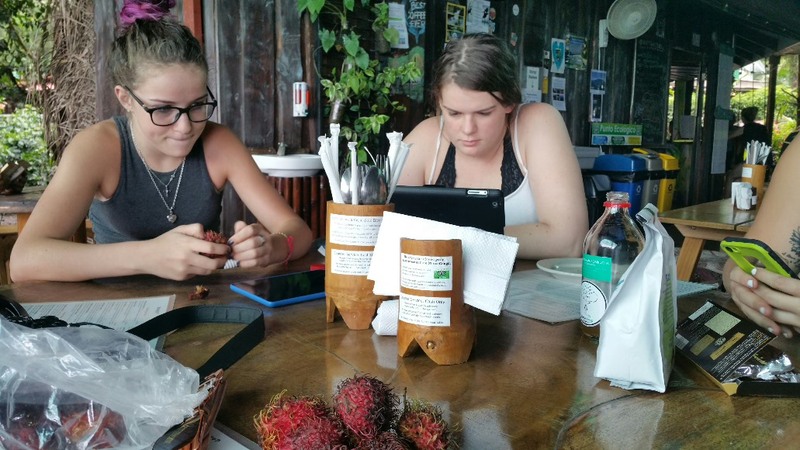 We took about an hour and half to log in to free WiFi at a little restaurant in Dominical. 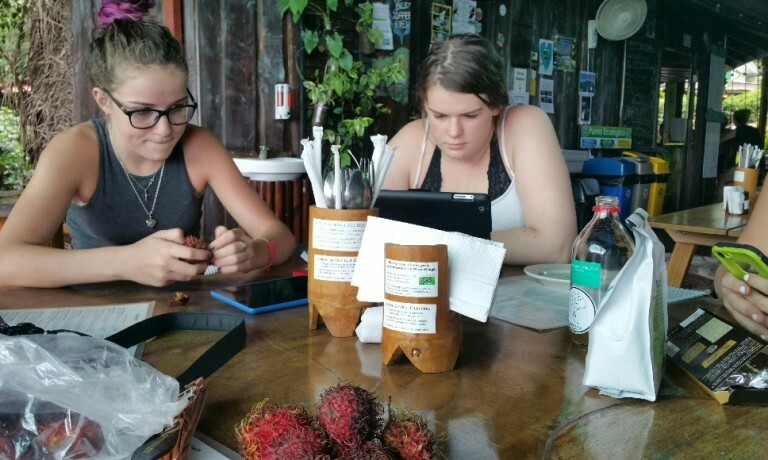 (We did buy some food and coffee… we’re not total mooches) The girls were able to get a few school lessons completed. If you didn’t already know that about us, our girls attend an online school based in Atlanta. As long as we can connect to the internet, they can still do their work and attend school from anywhere in the world. On the days we aren’t connected we can simply take those as vacation days. They get 35 vacation days a year. That includes Thanksgiving, Christmas and spring breaks plolys five more days. If we decide to take vacation at different times than designated, no pro. The can just do a few more days when everyone else is taking their breaks. It’s something that definitely works for us and one of the main reasons we have chosen alternative education for our children. We then drove only a few miles down the road to Poza Azul. 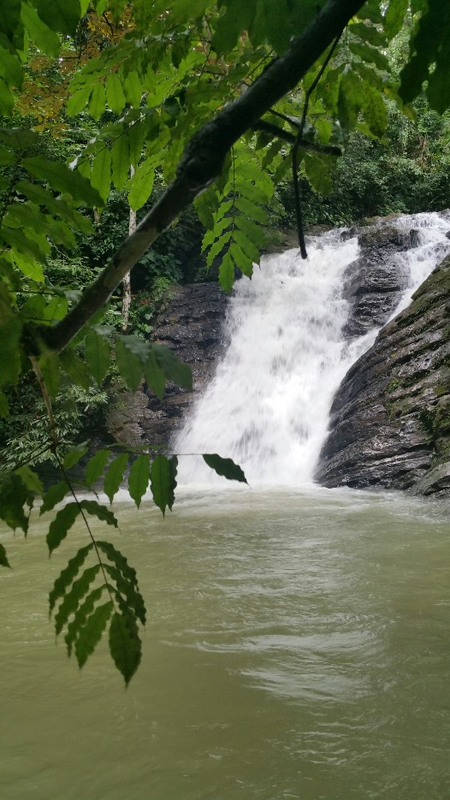 Which is a waterfall in an area called Dominicalito. To get to it you have to cross a river, however there is no bridge to drive across, so we did what any Tico would do… drive right through it. A little nerve wracking, but we made it just fine. We could hear the waterfall just up a little ways and in less than a quarter mile we were there. There was there sign at the top of a huge set of steps that leads down to the falls and the swimming hole at the bottom. The girls rushed ahead of us, eager to get in and swim. Before too long, they decide to build little towers of rocks staked up and play a game of throwing rocks at it to see who could knock the stack down with the best throw. They laughed and giggled for an hour playing their new game. 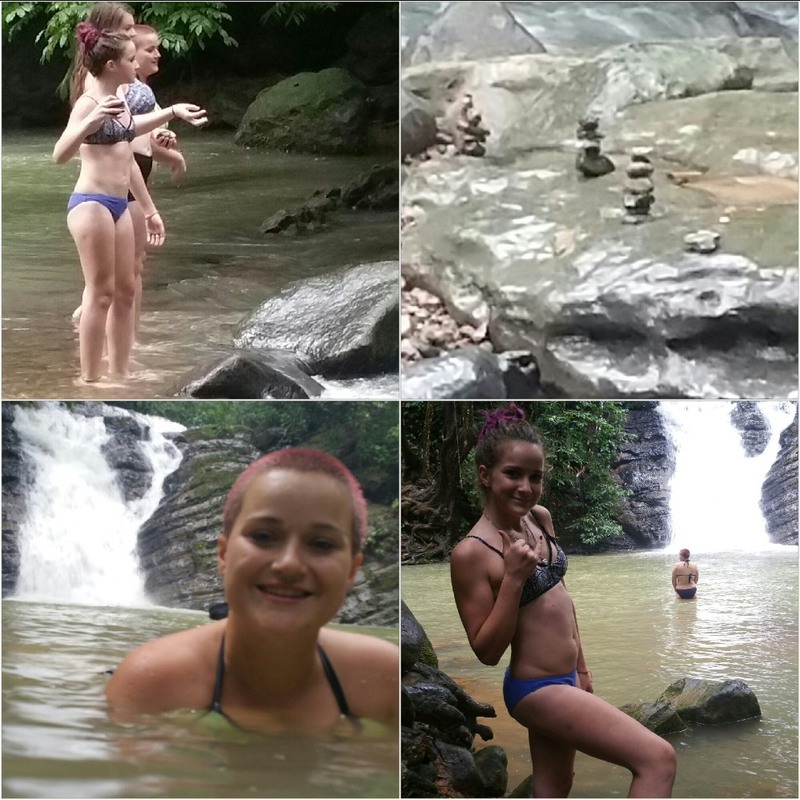 We took lots of pictures and video of our time at the falls. After walking back up the steps to our car, everyone had built up quite an appetite. So we made an assembly line in the car to make everyone peanut butter and jelly sandwiches. 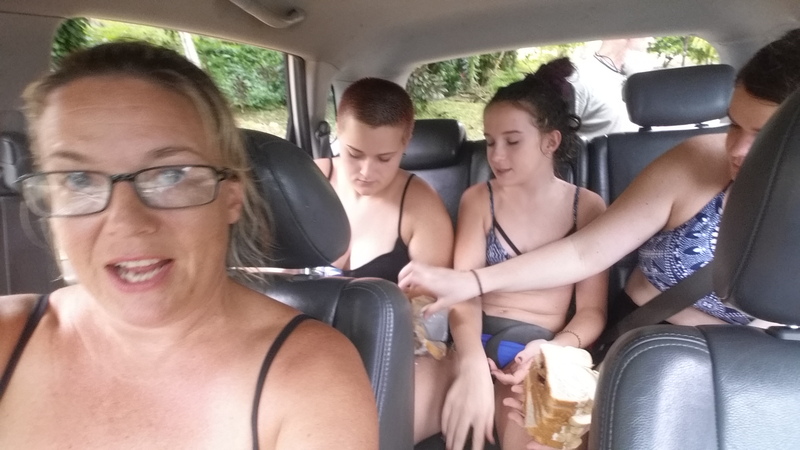 The day before we went to the supermarket and purchased bread, peanut butter and jelly along with snacks and fresh fruit for when we are traveling in the car. They tasted so good! Later in the evening, we had accepted a dinner invitation with some friends that we first met here about seven years ago. They are from California originally and have lived here for several years, though they are currently living in the states and only here for a visit. So the timing was really kind if amazing that we were here at the same time. They have built a beautiful condominium complex on several acres in the mountains. It was really neat to be back after so many years and sew physically what was only described to us years ago. We look forward to keeping up with them more in the future. Tomorrow we drive away from the coast into the mountains to our next stop to visit the Arenal volcano.